Sleep is very important when it comes to a person’s health and not getting enough can be detrimental. Around eight hours of good-quality sleep is what’s recommended for the body to function properly. But in the midst of winter the weather can impact how good a night’s sleep we get and how we feel in the morning. 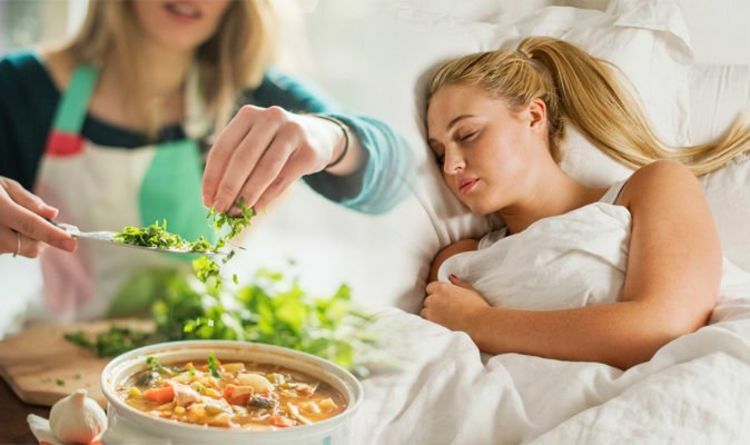 To help wipe out this winter tiredness the NHS recommends three foods to eat. Alongside winter temperatures, shorter days and longer nights, being overweight can affect your energy levels and leave you feeling sleepy. This makes eating a healthy, balanced diet very important. The NHS says: “Once the summer ends, there’s a temptation to ditch the salads and fill up on starchy foods such as pasta, potatoes and bread. It explains: “Winter vegetables – such as carrots, parsnips, swede and turnips – can be roasted, mashed or made into soup to provide a warming winter meal for the whole family. When it comes to what drinks to have before bed, Neil Robinson, Sealy UK’s Chief Sleep Officer, recommends chamomile tea. He said: “Chamomile tea increases the levels of amino acid glycine in the body which causes our muscles to relax. Neil also advises eating kale and bananas to help you get your forty winks. Calcium is a natural sleep aid, which is why a deficiency in your diet may make it difficult to fall asleep. Neil explained: “Calcium contains tryptophan, the amino acid that your body uses to create melatonin – a hormone that helps induce sleep. Bananas are useful when battling insomnia due to their naturally high levels of amino acid, tryptophan, according to the expert. Eating almonds, oats, cherries, peanuts and avocado are also recommended as sleep aids.